If you’re looking at this, then we have directed you to this post for some reason. We have written tutorials for some of these, and we are working on more. Since we don’t use every client, if your favorite adds one of these features, let us know! The basic information: you’ll need to know a couple things when setting up most of the clients below. That’s the bare minimum; but of course if you have your nickname registered, all of the recommended clients will specifically have a box to save that for auto-identification. SSL: This is the protocol that encrypts the connection between you and the server and uses its own ports, i.e. 6697 by default. Server to Server links are SSL as well. You can view if another user is using SSL by using whois and looking for the line “is using a secure connection”. 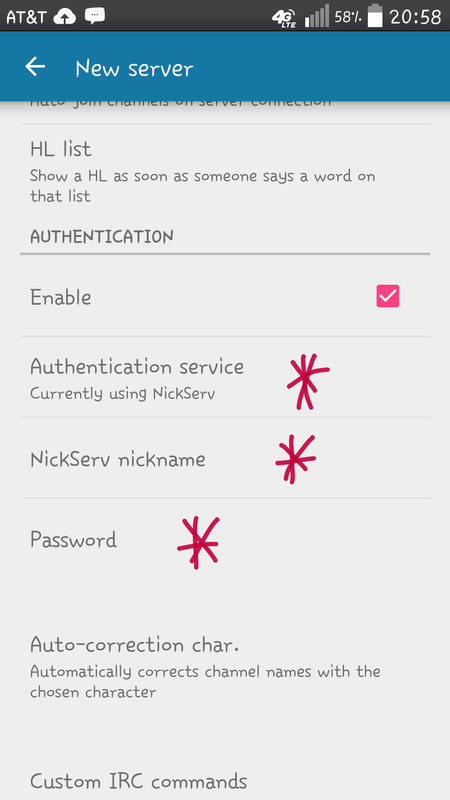 SASL: This is nickserv authentication during connect. With this, it allows for immediate vhost application, immediate joins to channels using +R or other authentication restrictions, and best of all, immediate kill nick protection. Curious about SASL itself? Its not just an irc thing. SSLfp: This is the client using an ssl certificate to provide a “fingerprint” to the server as the method of authentication instead of a password. Some clients support using this method in conjunction with SASL, some do not. If they can be used with SASL, its referred to as SASL-External, if not, then post-SSLfp. FiSH: This is a method of user to user encryption that is supported by a few clients that requires exchanging a common key. HexChat — tutorial for basic setup here, SASL here, and SSLfp here [SSLfp as SASL-External is supported] as well as FISHLim. Available for Windows, Linux, and as source. For OS X, see XChat Azure also — HexChat is no longer working on an OS X Client. This is the client that we will recommend for desktop use — straight forward setup and available for the major operating systems. 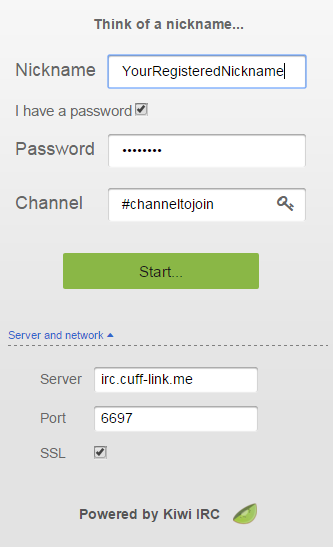 If you have used xchat in the past, this is a fork and very similar with a few modern tweaks. AdiIRC — Windows – Lightweight option that supports SSL, SASL/SASL-ext, and SSLfp in the server list. Howto is here. KVIrc — Windows, Linux, fbsd, source, and OS X options for installation. 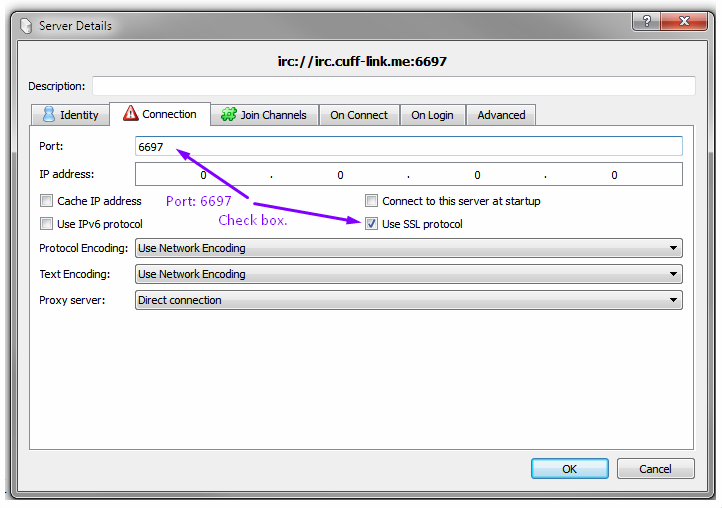 Supports SASL in the network setup via checking the box in the Advanced tab “Query extended capabilities on connect” and filling in the SASL information. It also supports post-SSLfp. How to is here. Textual — OS X client that has a 30 day trial period, after which it currently costs $4.99 USD in the MAC App Store. You can find instructions on setting up SASL here. Colloquy — OS X client, which is free for desktop use. While it has SASL support, we do recommend HexChat. Quassel — Multi-platform client that can be set up as a standalone or distributed, see here for more info. Supports SASL and SSLfp as SASL-External. Konversation — KDE default on Linux. Supports SASL and post-SSLfp. irssi — Natively supports SSL and post SSLfp. Versions 0.8.18 and later have SASL included. For previous versions, a plugin is required. Limechat — ios client that supports SSL, SASL, multiple servers and is currently listed for $2.99. There is a wiki-how here for basic setup, refer to the info at the top for populating. IRCCloud — IRCCloud is, in effect, both a full-fledged IRC client and a bouncer. The free version gives you two hours of inactivity before disconnecting you from the network. This is removed in the paid version. 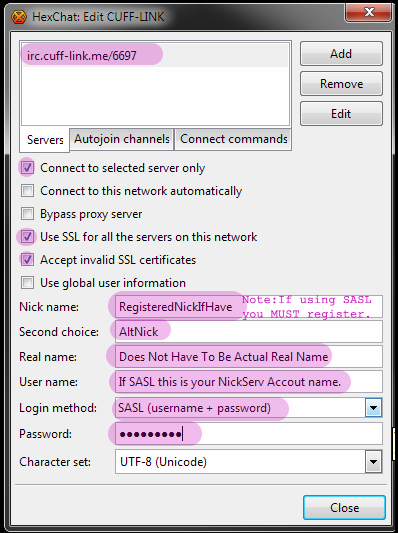 Supports SASL by default based on entered nick. Requires an account through them separate from us. We are listed in their server list. KiwiIRC — doesn’t say so, but it’s built in as the authentication default ***NOTE: As of about 4/12/16, kiwi has been ignoring the specific port and leaf options, so if you are using it for the auth-only server, you’ll need to use something else. This method doesn’t require having a mibbit account, however saves from potentially mistyping into a channel or missing the 60 second window. Clients we don’t support… If there is something you’re in love with about one of these, ask us, we might know of a modern alternative that is actually easier to use. pidgin/purple — This is a preference, however there have been issues regarding the “irc-more” plugin leaking into parts and quits. Current versions do appear to support SASL though. mIRC — Supports SSL and sort of supports SASL. mIRC pre v7.36 — SSL was finally added natively in 7.36, otherwise its an additional dll. TurboIRC — mobile client available for ios and Android, however does not support any kind of authentication verification other than an on-connect command. Nettalk — This one does have several translations and supports SSL, however doesn’t support SASL. Limechat — Windows/Mac/ios, but very little documentation. BitchX — love the names and quits, but, get with the times. Try irssi or weechat for your terminal irc’ing needs. pirch — Its not 1999 anymore. mirc v5.x — v6 was released around 2003. HydraIRC — Last updated in 2008 and doesn’t natively support SSL.